Love the print. Is soft and comfortable. Transform your bedroom with the tranquil color and elegant pattern of this light and lovely duvet cover set. The set comes with two matching shams and two decorative pillow for a pretty and polished look that uplifts and elevates decor. I ended up returning this duvet cover set. The king size pillow shams were larger than the king pillows I was using. The duvet was very nice and the colors looked like the photo. I also liked the additional pillow. This duvet set is very nice and a great bargain for the set. The fabric has a slight sheen to it and the colors are muted and soft. They are a warm gray, soft off white, taupe and cream. I love Love LOVE this Duvet cover. The colors go even better than I anticipated. It has a little cream color to offset the grey. The thing I absolutely love the most is that it doesn't show the dog hair. We have an austrian shepard /boarder collie mix with lots of long black hair. The hair doesn't stick to the cover nor does it show. I purchased this cover after reading another review regarding the dog hair. She was absolutely right! Love the colors and how it complimented my bedroom decor. I love the way the soft colors blend together for a very restful feel. The duvet cover fits well and is easy to put on. The set is sturdy enough to take two large dogs coming up on the bed for snuggles and launders well. You also have a few sheet color options with this set. Well worth the money. Love the fabric, colors are true to photo. My only complaint is that the pillow shams could be longer. My standard size pillows come to the very edge of the sham. Really liked this product. It has held up to many washes and has not faded at all. Good material and has ties on the side so the duvet stays in place. The decorative pillows are nice as well. I am in love with this duvet cover. I ordered my last one online and ended up hating it so I was nervous. But this is fantastic. It has ties to hold the comforter inside and is so cozy. Love the design. Very pleased. This duvet cover and pillows are beautiful. The quality is very good. It makes for a very relaxing setting for my bedroom. I would recommend this. Pretty pattern but wish the cover was a bit longer on the sides. Really good quality. It doesn't look so formal in person. It's really beautiful! High quality duvet...great colors and great price!! Love this set. The colors are perfect with my wall colors. It is very classy and everyone loves it. I would buy it again. It is well made. 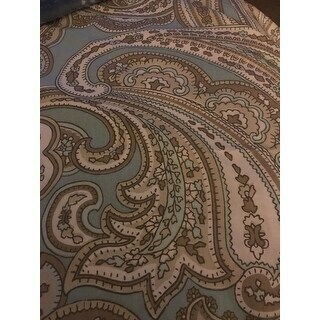 The colors on this duvet are true to the pic, this is the 2nd Duvet set I have purchased from this brand and love every part of it, true comfort and quality. Wow, I really love this set. The linens are very soft and soothing. The loft of the comforter is just right - not too hot for our N. CA weather. I have done divert covers the past few times I changed my set and I was hesitant to go for a comforter but I'm really glad I did -- I love climbing in to my bed with this beauty on it. This set was almost perfect. In the photo, the duvet appears to be a dark taupe, and it could in fact pass for a greige depending on the wall color, etc. In my bedroom light, it's a deep grey. I'm returning it because I couldn't find a goose down comforter to fit the dimensions. I'm in love with the pattern so I'm going with the coverlet instead. Great duvet for the price and the colors match the picture. Overall I am happy with this purchase. The duvet went on very nicely and I like that the buttons are hidden. It is just as the photos show, same color and style. Very nice~would definitely recommend this to others based on quality and value. The fabric feels great... looking forward to bedtime to cozy up! This set is very beautiful and it was nice to receive the matching pillows with duvet. The fabric is extremely soft and comfortable. The inside of the duvet does have ties so you can secure your feather bed and not have to worry about it moving around on you. I’m very happy with this purchase and would recommend it to others. Very soft and comfortable. Fits the bed well. Really like that the shams and pillows all come together. If you don't want all of the pillows on the bed could put one in a chair in the bedroom. Had shopped alot and this is a great value. Beautiful! Fit my bedroom perfectly! 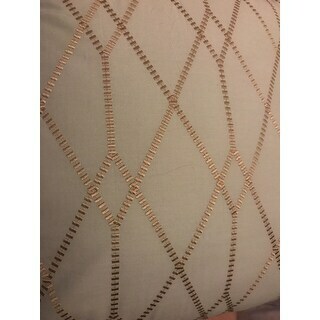 Really pretty duvet and hmmm pillows, but the fabric is not soft and luxurious, it is very rough fabric. The colors are soft and warm...perfect for achieving that coastal look for my master bedroom. "I’m interested in the grey paisley duvet cover. Because of the uncertainty of monitor colors, I’m not sure what color sheets would complement the cover. Can you assist me?" "This looks more taupe/light brown in the picture, which is what I am looking for. But the description says blue/grey. What color is it closer to?" The “base” color is soft blue with a blend of Taupe. "Is there a dust ruffle that you would recommend with this set?" "The grey looks like it might have a touch of yellow in it. Does it?" My monitor does not show yellow. I see yellow in it too. "Does the duvet cover have ties in the corners to help keep the duvet inside in place? Thanks." Hello stephani222,yes, this duvet cover does have inside ties in the corners to help keep the duvet inside in place. Have a great day! "What is the pillow case mesurement of the Cal King set"
Hello Gina, the california king shams are approximately 20 inches wide x 36 inches long. Thanks for shopping with us! It looks like is will be a beautiful calming color option for my bedroom I hope it does. I am buying it for a Cal King bed.